This is a really good way of testing out practical measuring skills in Maths lessons. I always teach measuring by incorporating a Harry Potter themed Potions lesson. Pupils follow potion recipes to create potions from the Harry Potter universe, e.g. Polyjuice Potion or Skele-gro. I have a mixture of powders (cornflour), plants (herbs) and potions (water with food colouring). I then have pipettes, a range of different containers with different scales for measuring liquids, scales for measuring the plants and powders, in addition to gloves for handling the ‘poisonous’ plants, a pestle and m ortar for the plants and stopwatches for timing. This lesson incorporates so many areas of measuring and could be extended for higher ability (maybe include conversions) and differentiated for lower ability easily. Fortunately we have a great Science department at our school, who are always able to provide me with an interesting collection of glass containers. Additionally, I have test tubes in a test tube rack, a bowl and a wooden spoon per pair. Pupils follow the instructions in the recipes, choosing appropriate equipment. They then pour their final potion into a test tube to be judged. Teachers and teaching assistants always dress up in their Hogwarts robes for this lesson and pupils’ potions are then judged on ‘appearance’ and ‘aroma’. To continue the Harry Potter theme, we judge them as if they are O.W.L.s (Ordinary Wizarding Levels) where pass grades are O (Outstanding), E (Exceeds Expectations), and A (Acceptable) with fail grades being P (Poor), D (Dreadful), and T (Troll). This continues the theme and provides the lesson with a clear structure. In the past I have also ‘sorted’ pupils into houses and then awarded house points, so there are many ways in which this can be extended. The advantage of this kind of activity is that not only does it allow pupils the opportunity to test out skills they need to be able to apply, but it provides a memorable activity that engages even the most disengaged children and leaves them with an experience they will remember. I find wristbands to be particularly useful when I am including jigsawing in my lessons. They are great for grouping and pupils love them! 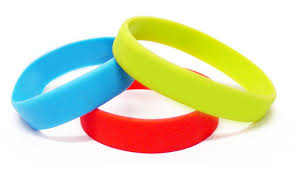 Rubber wristbands are easily found on the internet. I bought mine from Ebay. Pupils are in groups and learn about a topic or concept. Pupils form new groups with a representative of each topic from each of the original groups. All pupils should have learnt about each of the topics. Pupils go back to their original groups to share what they have learnt and consolidate their learning. All red pupils learn about a specific topic or concept, whilst pupils with a different coloured band learn about something else. It is then easy to form new groups with pupils of each different colour. They are then able to share their knowledge of each topic or concept so that by the end of the time, all pupils should have learnt everything you need them to. Problems can occur when pupils have not spent their initial learning time effectively as this can mean that some groups do not benefit from all the knowledge you intend them to gain. Ideas for overcoming this include pairing up pupils (particularly effective for lower ability pupils); giving each group time to discuss and summarise their topic before imparting what they have learnt on the other groups; providing the newly formed groups with additional resources to support them in learning about the additional topics that they weren’t originally responsible for. I find that providing additional time at the end for the original groups to reform provides an opportunity for pupils to reinforce and consolidate their understanding of the different topics. It also prevents any pupils being disadvantaged by being in the second group with any pupils who may have originally been disengaged in their part of the information gathering.